Defines an area within which you can explicitly position child objects by using coordinates that are relative to the area. Canvas Initializes a new instance of the Canvas class. Left Gets or sets the distance between the left side of an object and the left side of its parent Canvas. Top Gets or sets the distance between the top of an element and the top of its parent Canvas. ZIndex Gets or sets the z-order rendering behavior of objects in a Canvas. GetLeft Gets the value of the Left attached property for a given object. GetTop Gets the value of the Top attached property for a given object. GetZIndex Gets the value of the ZIndex attached property for a given object. SetLeft Sets the value of the Left attached property for a given object. SetTop Sets the value of the Top attached property for a given object. SetZIndex Sets the value of the ZIndex attached property for a given object. LeftProperty Identifies the Left attached property. TopProperty Identifies the Top attached property. ZIndexProperty Identifies the ZIndex attached property. A Canvas is one of the Panel elements that enable layout. Each child object is rendered within the Canvas area. You control the positioning of objects inside the Canvas by specifying x and y coordinates. These coordinates are in pixels. The x and y coordinates are often specified by using the Canvas.Left and Canvas.Top attached properties. Canvas.Left specifies the object's distance from the left side of the containing Canvas (the x-coordinate), and Canvas.Top specifies the object's distance from the top of the containing Canvas (the y-coordinate). Because absolute positioning does not take into account the size of the browser window or browser resizing, using Grid or StackPanel as a container is often a better choice. For more information, see Silverlight Layout System. You can nest Canvas objects. When you nest objects, the coordinates used by each object are relative to its immediate containing Canvas. Each child object must be a UIElement. In XAML, you declare child objects as object elements that are the inner XML of a Canvas object element. In code, you can manipulate the collection of Canvas child objects by getting the collection that is accessed by the Children property. You can nest Canvas objects, because a Canvas is a type of UIElement. The Background property is equal to nulla null reference (Nothing in Visual Basic). The Visibility property is equal to Visibility.Collapsed. 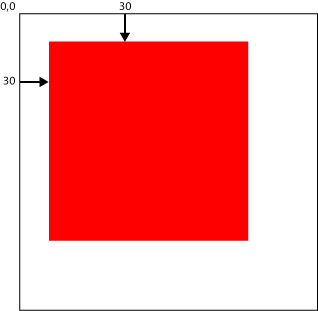 The following example shows how to position a rectangle 30 pixels from the left and 30 pixels from the top of a Canvas. In the following example, the root (white) Canvas contains a nested (blue) Canvas that has Canvas.Left and Canvas.Top properties of 30. The nested blue Canvas contains a red rectangle that also has Canvas.Left and Canvas.Top values of 30. 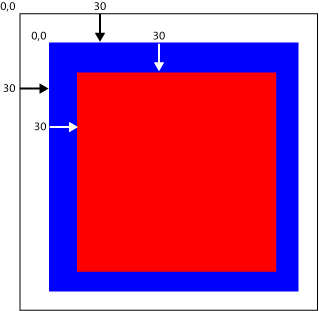 This creates the effect of a red rectangle bordered by a blue rectangle. This same layout could be achieved using a Border object.